YETIS is a youth snowmobile club that was formed in 2015 at the Hayward, WI High School. 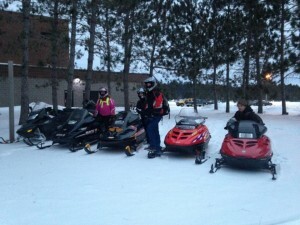 Their purpose is to promote safe snowmobiling. The club is sponsored by Northwest Relic Riders Vintage Snowmobile Club and by the Sawyer County Snowmobile & ATV Alliance. The Alliance is proud of the YETIS’ efforts to promote youth snowmobiling and excited to work with them and see their membership grow. The first year as a group we passed a change through the School Board allowing a snowmobile trail from Highway 63 to the High School. We have scheduled several “Ride to School” days for club members and are hoping to do many more. Adult volunteers have been on hand each time to monitor the activity, which proved to be a lot of fun for participants. YETIS – Ride to School!